I get a lot of questions about postpartum depression and how it relates to twin pregnancy and expecting twins. Let’s walk through postpartum depression today. What it is, how you can tell if it’s happening to you, and what you can do to support your partner in your family. First of all: why? Why does postpartum depression happen? Most of the science behind it is that the trigger when there is a drop in hormones after the twins are born. Moms spend the entire pregnancy building up this these hormones to nurture and take care of the body and the babies. Then when the babies are delivered all of a sudden, BOOM!, the estrogen levels are dropping that progesterone levels are dropping and that can trigger this postpartum depression. 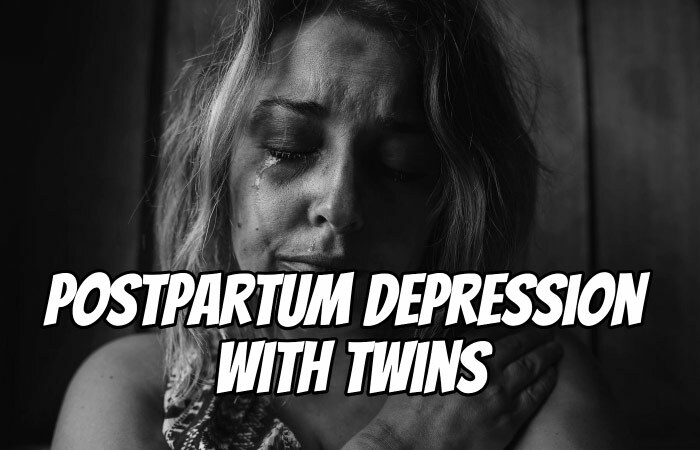 Postpartum depression isn’t just these hormones and these chemicals but it can also be influenced by the entire experience of twins which can lead to some mental challenges. Think about a twin pregnancy if you’ve already had your twins or if you’re going through that right now. Twin pregnancies are not easy. Not easy at all. What happens is that the pregnancy puts a lot of stress on mom because she may be on bedrest several weeks. She may have had to quit work earlier than expected because of bedrest. She may be limited in her ability to help other kids in the house or even prepare the house for the twins. This can be a cause of stress. Also, twins come very early. Because they come very early the birth experience may not have been what you were hoping for or expecting. Maybe you’re hoping for a natural birth with a vaginal delivery. But the twins came super early, had an emergency C-section, and it just wasn’t what you were expecting or what you looking for. Because twins tend to be born early they may spend time in the NICU and may be in the hospital for days or for weeks or for months. That is not what you expected either. You may start to have feelings where mom is thinking it was her fault that the babies were born early or that they had to spend time in the hospital (which is you know is not really the case). But those feelings can start to creep up and you may feel inadequate that you’re not prepared to care for two babies at the same time. It’s kind of a combination of the overwhelming experience of having twins and the hormonal changes that mom experiences after the delivery that can lead to postpartum depression. There is some research that indicates that mothers of twins (or more) are more likely to have postpartum depression than moms of singletons. 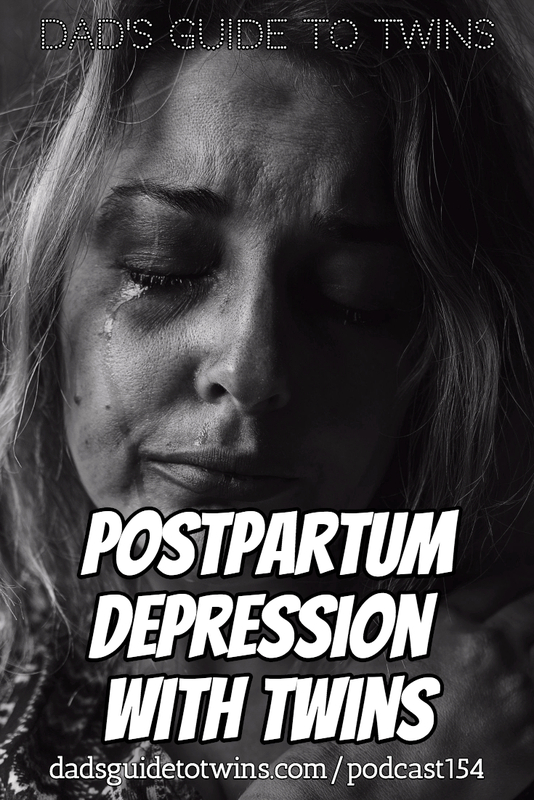 There are two potential phases of postpartum depression. The first is often called the baby blues. Now these are a very typical experience for mom after a baby is born. The baby blues may last a few days to a few weeks. It’s kind of a temporary emotional burden that the mom goes through for just a short period of time. Contrast that with a longer term postpartum depression which can last for weeks or months if it’s not treated. Postpartum depression can really interfere with your daily interactions with your family and your daily tasks that you may have. Let’s talk about some of the symptoms of postpartum depression. You can look for these in mom or in yourself or your partner to see if it’s happening for you. Now if you see some of these in isolation, it may not indicate postpartum depression but when you start to see several of them together or extreme intensity in these it can be a sign or an extra red flag for you. The first is mood swings. If you’re having dramatic mood swings during the day, it could be a sign of postpartum depression. The second one is overwhelming sadness and crying. You’re crying because your baby is crying, because of the way things are going, or maybe just something you saw on TV. You may even cry due to memories of the pregnancy or birth or yearning for different outcomes. Lots of emotion and lots of sadness. You may also be feeling overwhelmed and totally frustrated. 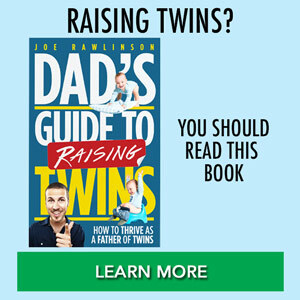 Twins are overwhelming and it can be frustrating but if you never see a break to that feeling, that it could be a sign for you. Watch how you’re eating. Are you eating all the time and eating too much. Or have you totally lost your appetite and you’re not eating at all, especially foods that you used to enjoy eating. That could be a sign of depression. Look at your sleep patterns. Now you may have to separate out the fact that you’re going to be up at all hours taking care of the twins. But when it does come time to sleep are you able to sleep or are you suffering from insomnia and the inability to sleep? Or do you just want to sleep all the time even when you know you’ve got enough rest? Are you worried about your ability to care for your twins? You don’t think that you can do it. You don’t think that they’re safe with you. You think that you may do some harm to them. These are some serious indications that you could be depressed. Look for intense emotions like anger and anxiety. Look back to where you were before you were pregnant and you had the twins in your life. If you’re having these intense feelings of anger and anxiety that could be a sign that things are changing for you. Once your babies are born hopefully you’re able to bond with them and emotionally connect with them. But if you’re having difficulty bonding with your babies that could be a sign that you’re suffering from the baby blues or with postpartum depression. If you feel like you’re not a good parent and “I’m never going to be a good parent. I’m never going to figure this thing out.” That could be something to be concerned about. Think about the stuff that you used to enjoy doing. The experiences you used to enjoy like activities, food, and friendships. If you don’t find any joy or happiness in any of those things anymore or even joy your happiness in the time with your babies that can be a red flag and a serious condition. Remember these are just a few of the symptoms that could indicate postpartum depression for you for mom for your partner. If you’ve been having these for a few days or few weeks after the babies are born, it might just be the baby blues and you should be OK soon. If these feelings continue after that initial period it could be a sign of depression. If you start to see a lot of these symptoms, it is important that you immediately talk to your doctor. You’re not alone in this. Many moms go through this. Dad, if you’re trying to help your spouse, reassure her that this is a common thing and there is help and there are solutions for it. Immediately reach out to the doctor to see what can happen. Your doctor will ask you a bunch of questions and you have to see how your “day in life” is going and compare that to how things were going before. But the doctor can really help guide you through and help you get out of that postpartum depression. One option is therapy and counseling which is very effective. Additionally, you could meet with other moms in a similar circumstance. So that will help you know that you’re not alone and you can get through this together. Your physician may also consider prescribing medication or antidepressants help guide you through the depression. Remember to seek medical help immediately if you sense that postpartum depression maybe affecting you or your spouse. Don’t wait because it’s not necessarily going to get better with time. It may just continue to get worse. As a spouse, how can you help your partner navigate through postpartum depression? Make sure that the mom is able to get some time away from the craziness. Get time away from the kids. Maybe it’s going out to run errands or go shopping or be with friends or go for a girls night out. This will help her have some time alone and to recharge and take a breath and realize that things are going to be going to be OK.
It’s also important to together as a couple you’re setting realistic expectations of what is possible with twins. Everything is going to get turned upside like your schedule is upside down your house being cleaned out. That’s not going to happen anymore. You know making food preparations for you both is going to suffer. Getting out of the house is going to be a challenge. Dad if you recognize some of these signs of postpartum depression in Mom it’s important that you ask for help. Talk to her about what you’re seeing and offer to take her to the doctor or to call the doctor if she doesn’t want to do that. Try to help Mom meet with other moms from your local mom’s group to help her know that she’s not alone in this journey. Something else that you can do to help cope with this is to make sure that you’re staying healthy and taking care of yourself. So Mom and Dad, make sure that you’re eating good food. You’re drinking lots of water. Get some fresh air and some exercise. Put the babies in the stroller and walk around the neighborhood. There should be opportunities for you to meet with and talk with other parents of twins or multiples. Many cities around the world have clubs. So you may want to look for those in your area and you can meet with those folks. Plus there are lots of our online forums and Facebook groups so you can reach out and talk to other parents about what’s happening and see what their experiences were and how they got through those. Try to get as much rest as possible because if you’re feeling anxious and depressed and then you’re not getting a lot of sleep then it’s going to compound and make things worse. I know it’s very difficult in the infant months but do your best. If you’ve experienced any of the symptoms of postpartum depression make sure that you talk to your doctor about what’s going on, how you’re feeling, and what are some options for you. Your doctor can help you with some therapy, consulting, and/or some medication to help you get through that period of depression. You can make it through and there is help for you. You’ll find it in your fellow parents, your doctor, and your spouse.